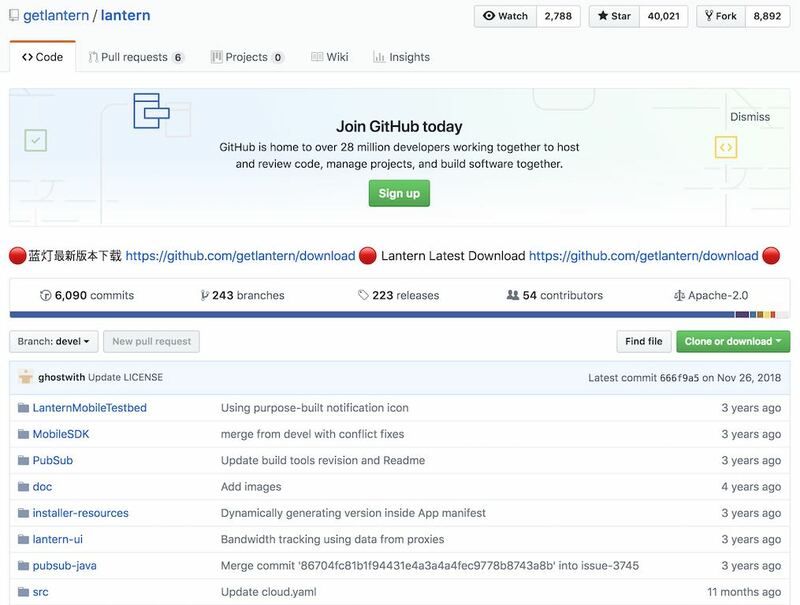 If you’re wondering how Lantern holds up as free, open source software, you’ve come to the right place. Scroll down to find out everything you need to know about the proxy. 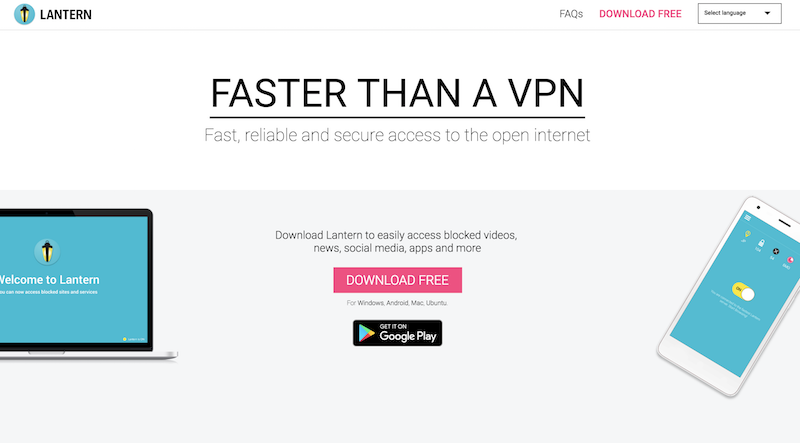 “Faster than a VPN” is what Lantern takes pride in as seen on their website. So does that mean it’s not a VPN? Lantern isn’t a full VPN service but a free, open-source proxy. It never promises otherwise. Still, let’s find out if its claims of lightning fast speeds are true and how it holds up against other similar proxy services and VPNs. 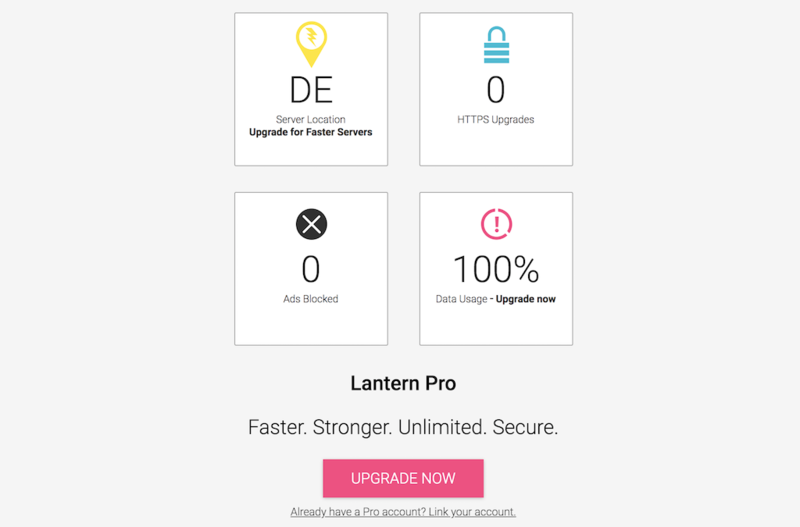 Lantern says it’s faster than a VPN, and it seems like it’s true. We tested their speeds through speedtest.com and got a whopping 99Mbps and 98Mbps in download and upload speeds. Most free VPNs and proxies do not reach the high two-digit number, so it’s a pretty impressive result. You can simply download the software directly from their website on your desktop or Android through the Google Play Store. After installing the client, you’ll be taken to this page on the browser. A green button on the bottom right corner tells you your connection status. For their Pro version, you need to give an email address where they’ll presumably send you the download link for their premium service. 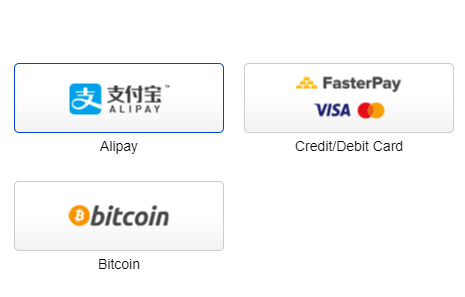 If you decide to purchase their Pro plan, you can choose between Alipay and major credit/debit card options including Visa and Mastercard. They do accept cryptocurrency in the form of Bitcoin. This “VPN” is absolutely free and open source. Users may contribute to the proxy’s GitHub. However, there is an option to upgrade to a Pro plan, which gives you faster speeds and unlimited bandwidth, lets you connect three devices, and blocks ads. It also supposedly blocks better than the free version. For a 1-year subscription, the price is $38, or $58 for 2 years. $38 a year is a very reasonable price, especially if you do the math and realize that this plan comes out to around $3 per month. Still, this is not a full VPN, and NordVPN–one of the best VPNs in the market–also offers $2.99 per month on their 3-year subscription. So long as you don’t mind paying upfront, that’s a way better deal. Lantern’s premium plan allows you to connect three devices simultaneously to the proxy. It supports Windows, Mac, and Ubuntu if you’re on Linux. An app is also available for Android. Lantern’s software can be accessed on your taskbar tray. You can click their icon to connect or disconnect. 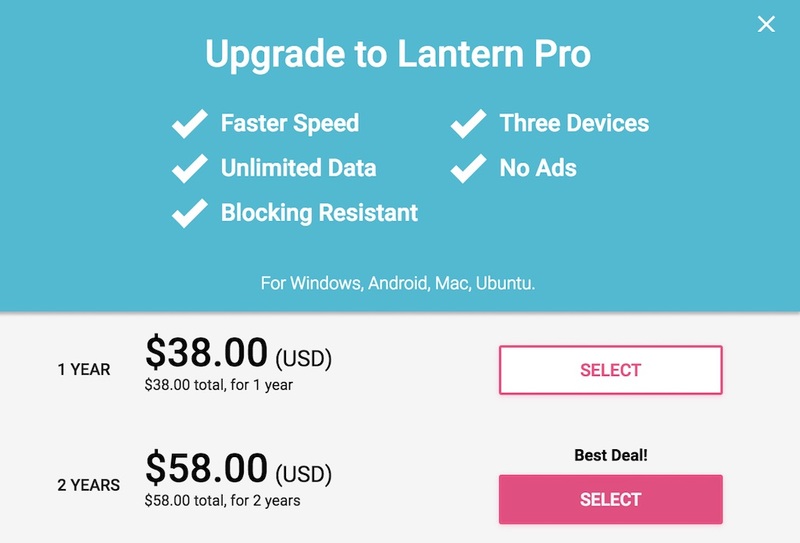 You may also click “Show lantern” to be led to their website with your account stats like data consumption, the number of ads blocked, the number of https upgraded, and the server you’re connected to. 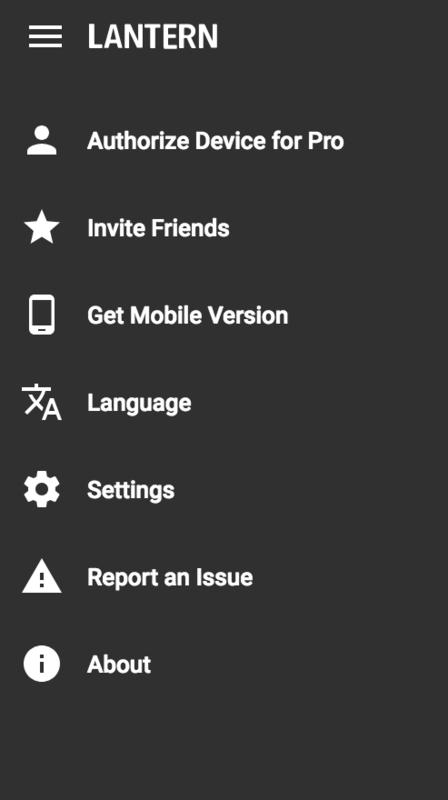 There’s a left-hand navigation menu to change your settings. Lantern’s website features an FAQ section where you can see some basic questions. For any technical information, just go to their GitHub page. Since it’s open source software, any information you need will be on there. Lantern doesn’t give you an option to choose your own server. It’ll automatically choose the best one for you. They have global servers located around the world but there’s no public list. When we connected to their proxy, we were rerouted to a server in New York. Proxies that go through Netflix’s firewall is a rare sight. Folks, Lantern is one of those elusive VPNs and proxies. Settle down for a night in with your favorite Netflix show. At least, for a moment. Lantern stopped working soonafter and we couldn’t make Netflix work again. 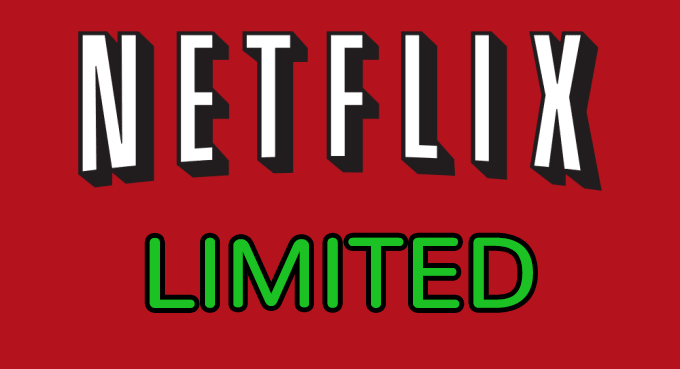 But in case your proxy doesn’t do the job for you–it happens, you know–make sure to check out the best VPNs for Netflix. Lantern isn’t a full VPN but a proxy for bypassing blocked websites. Unless you’re on the Pro plan, you’ll have limited bandwidth of 500MB per month which will make downloading torrent files difficult, not that we condone piracy of any kind. Not to mention that your anonymity is not guaranteed with a proxy service like Lantern. If you don’t want your information exposed, leave Lantern alone and go with the best VPNs for torrenting. For their premium plan, Lantern does not give any refunds since they allow access to their servers for free so users can get an idea of what their services are like before committing to their plan. If you experience malfunctions like the product not being delivered upon purchase or encountering service and website errors, we advise you to contact the proxy’s support team. Lantern does not have live chat options. You may reach them through email or access their Support page which is basically a Google Community with FAQ content. Take a deep long breath before you read what information is collected by Lantern. But wait, there’s more. Lantern also says that they may collect information on user devices. This means they could potentially collect the hardware model, operating system and version, software and file names and versions, preferred language, advertising identifiers, serial number, device motion information, and mobile network information. On top of all of this, they also collect connection logs. When connecting to Lantern, keep in mind that you hand over a lot of information to them. We suggest you skip this one if you care – at all – about your privacy. Lantern is fast, but is it secure? Unfortunately, we ran an IP leak test and were pretty disappointed. The IP leak test is disappointing. Lantern managed to pull through with the DNS leak test, though. The proxy utilizes the military-grade encryption of AES-265 encryption with ECDHE RSA key handshake and doubles down with SHA hash authentication. This is some strong encryption and the fact that you can get this security for free is just a plus. 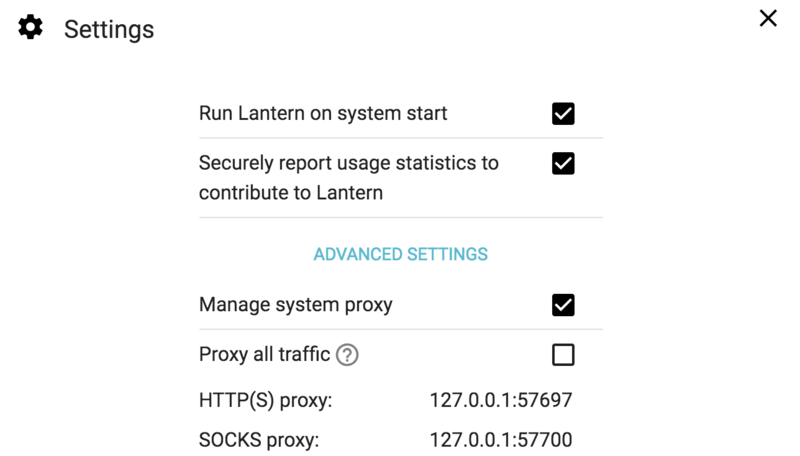 As you can see, Lantern uses the HTTP(S)/SOCKS proxies. The proxy does not have a kill switch. This is a rare feature for free proxy and VPNs, anyway. The premium version doesn’t have a kill switch either. Lantern is operated by Innovate Labs, LLC. Their mission is to keep the internet open and neutral, and they rely on seed funding and grants from social investors. The proxy has over 1,000,000+ installs. That might just be enough to convince you to give the proxy a shot. Lantern is based in Los Angeles, USA. This means that it falls under the jurisdiction of the Five Eyes Alliance, putting users at risk of having their data handed over to the government via court orders. Considering the types of information they collect, we sternly advise against you from using Lantern. That is, if you care about your privacy at all. Proxies, in general, are inferior to full-service VPNs. But it’s all about choosing what works best for you at the end of the day. Generally, we think Lantern collects way too much information from users and their leak protection isn’t the greatest. Their customer service may also come off as inconvenient to others. This is really only a service for people who might be interested in using a free, open source proxy and possibly contribute to the software. The paid plan is not worth its price tag since the best VPNs in the market offer similar rates with way more features, better protection, and a no logging policy.